Ebola ravaged Liberia for 9 months leaving behind the precious loss of life and stigma. Over 4,400 lives were lost in Liberia over the last year. Ebola has slowly made its way out of the country, but the scars remain. 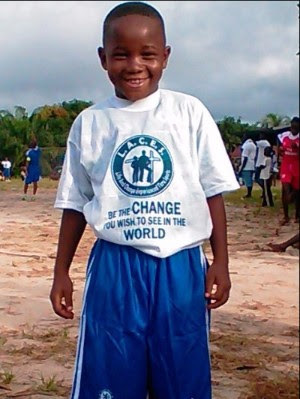 Prince is a 10 year old boy living in Dolo’s Town with his Mother, who is an Ebola survivor. Prince lost 5 sisters, 1 brother and his father to the deadly virus. According to his mother, Prince always smiled. Since his family’s death, Prince is bullied by others in his community, and instead of smiling, he now fights with anyone who makes fun of him. This is a common story we hear from the 90 children who recently joined our program that lost family to Ebola. Just like after Liberia’s 14 year civil war, L.A.C.E.S. was there to be part of the restoration of child soldiers. We are here again. We are here to protect our children, work alongside communities that were hardest hit by Ebola, fight stigma and bring about social healing.